HUNTSVILLE, Ala. (WHNT) – Sarah Palin, arguably one of the most well-known women in the Republican Party in the last several years, is scheduled to visit to Madison County next week. Dr. David Copeland, Madison County Superintendent, confirms to WHNT News 19 Palin will speak at New Hope High School’s graduation ceremony. The event is next Wednesday, May 21 at 8 p.m. at the Von Braun Center. It is an event that requires tickets, and a limited number will be made available, Dr. Copeland said. “What an honor for the students of New Hope High to hear such a prominent speaker as Mrs. Palin,” Dr. Copeland said. The students got the news at school on Tuesday morning. 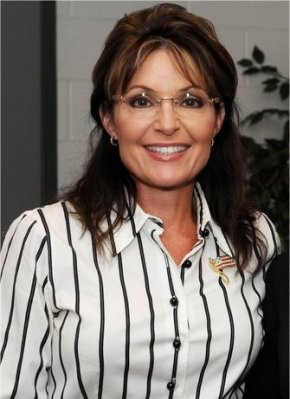 Palin is a former vice presidential candidate, the first Republican woman to get the party’s nomination. She ran on the Republican ticket with Sen. John McCain in 2008. She also served as governor of Alaska from 2006-2009. She currently works as a political commentator and endorses various Republican candidates for state and federal office. To maintain the integrity of New Hope’s graduation ceremony, attendance will be limited to the schools, businesses, and communities of New Hope and Owens Cross Roads that support the vision of the school and the accomplishments of the students and educators in the Madison County School District. A limited number of tickets will be available to the community and the public on a first come, first-served basis, through Dr. Copeland’s office by email: dacopeland@madison.k12.al.us. Palin, the 2008 Republican vice presidential candidate, mentioned politics, such as the need for energy and financial independence and smaller government, when she addressed a fundraiser for the Exceptional Foundation of Baldwin County. Much of her speech, however, centered on raising her youngest son, Trig, who has Down syndrome. The Exceptional Foundation was established to help special needs children and adults in southwest Alabama. Many in the audience Tuesday night in the ballroom of the Marriott Grand Hotel have family members with conditions such as Trig’s. Palin said work by groups, such as the Exceptional Foundation, that assist special needs children and adults are a blessing to people such as herself, who need help when faced with a difficult challenge. Palin praised efforts to help Alabama communities hit by tornadoes last week. According to WKRG-TV, Gov. Palin told the audience that she and her husband Todd would be meeting with tornado survivors Wednesday in Birmingham. Turns out she and Todd joined other Samaritan’s Purse volunteers assisting the victims of the recent tornadoes which caused so much devastation in the state. Today, Governor and Todd Palin joined Samaritan’s Purse in assisting tornado victims in Alabama. Todd Palin, four-time winner of the Iron Dog off-road snowmobile race across Alaska, along with his wife, former Alaska Governor Sarah Palin, joined Samaritan’s Purse volunteers to help tornado victims in Birmingham, Alabama, on Wednesday. After getting a safety briefing and talking with volunteers, the Palins joined a crew assisting homeowner J.L. Price. 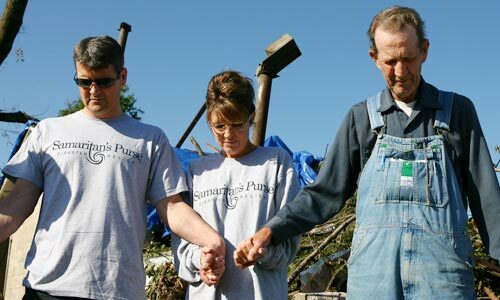 The couple helped haul off brush and debris, and with the rest of the crew, prayed with Mr. Price. The Price home took a direct hit from a tornado and sustained extensive damage. While going through the debris, Todd found a wooden plaque bearing the Price name and nailed it to a tree, one of the few things remaining standing on the property. This is the third time the Palins have participated in Samaritan’s Purse relief efforts. “I appreciate their willingness to bring hope to people in need,” Graham said. Read more and see pictures here.